The store is remarkably quiet except for the murmurs of customers who have found a memory. You hold it in your hand. And in nanoseconds, stories about your youth — or last summer — suffuse within you, taking you to another place. In your mind, the memory is vapor. Vivid, but vapor. But you’re holding something in your hand now, something bright and shiny and rich. A model car: A Ford Thunderbird. A Mustang. A ‘57 Chevy, A Shelby Cobra. A Camaro Z-28. A Dodge Viper. An Audi TT or Alfa Romeo 4c. It’s detailed. Real rubber. The steering works. The engine is in detailed splendor. A car you dreamed about is in your hands. A car you drove is here to share with friends. A car that you and your wife made out in — right there in that tiny back seat — is a memory you can take home and put on a shelf. 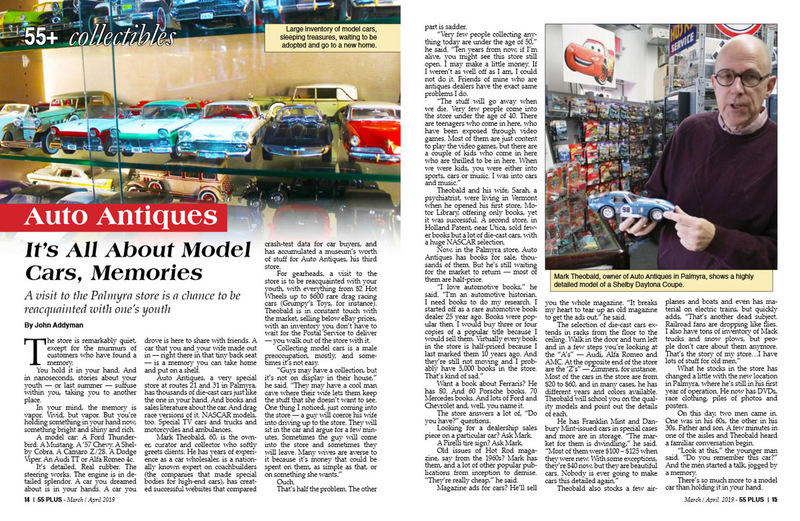 Auto Antiques, a very special store at routes 21 and 31 in Palmyra, has thousands of die-cast cars just like the one in your hand. And books and sales literature about the car. And drag race versions of it. NASCAR models, too. Special TV cars and trucks and motorcycles and ambulances. Mark Theobald 60, is the owner, curator and collector who softly greets clients. He has years of experience as a car wholesaler, is a nationally known expert on coachbuilders (the companies that made special bodies for high-end cars), has created successful websites that compared crash-test data for car buyers, and has accumulated a museum’s worth of stuff for Auto Antiques, his third store. For gearheads, a visit to the store is to be reacquainted with your youth in everything from $2 Hot Wheels up to $600 rare drag racing cars (Grumpy’s Toys, for instance). Theobald is in constant touch with the market selling below eBay prices, with an inventory you don’t have to wait for the Postal Service to deliver — you walk out of the store with it. Collecting model cars is a male preoccupation mostly, and sometimes it’s not easy. That’s half the problem. The other part is sadder. not do it. Friends of mine who are antiques dealers have the exact same problems I do. Theobald and his wife, Sarah, a psychiatrist, were living in Vermont when he opened his first store, Motor Library; offering only books, yet it was successful. A second store, in Holland Patent near Utica, sold fewer books but a lot of die-cast cars, with a huge NASCAR selection. Now, in the Palmyra store, Auto Antiques has books for sale, thousands of them. But he’s still waiting for the market to return — most of them are half-price. Want a book about Ferraris? He has 80. And 60 Porsche books. 70 Mercedes books. And lots of Ford and Chevrolet and, well, you name it. The store answers a lot of, “Do you have?” questions. Looking for a dealership sales piece on a particular car? Ask Mark. A Pirelli tire sign? Ask Mark. Old issues of Hot Rod magazine, say from the 1960s? Mark has them, and a lot of other popular publications from inception to demise. “They’re really cheap,” he said. Magazine ads for cars? He’ll sell you the whole magazine. “It breaks my heart to tear up an old magazine to get the ads out” he said. The selection of die-cast cars extends in racks from the floor to the ceiling. Walk in the door and turn left and in a few steps you’re looking at the “A’s” — Audi, Alfa Romeo and AMC. At the opposite end of the store are the “Z’s” — Zimmers, for instance. Most of the cars in the store are from $20 to $60, and in many cases, he has different years and colors available. Theobald will school you on the quality models and point out the details of each. What he stocks in the store has changed a little with the new location in Palmyra, where he’s still in his first year of operation. He now has DVDS, race clothing, piles of photos and posters. On this day, two men came in. One was in his 60s, the other in his 30s. Father and son. A few minutes in one of the aisles and Theobald heard a familiar conversation begin. “Look at this,” the younger man said. “Do you remember this car?” And the men started a talk, jogged by a memory. There’s so much more to a model car than holding it in your hand. PALMYRA, NY, January 17, 2019 - It’s a gearhead’s trip to Nirvana. Stop at the intersection of Rts. 21 and 31, glance south, and you see flashing red and green lights in a shop up a small incline. That’s Auto Antiques. Inside, Mark Theobald, sells memories in large and small doses. He has thousands and thousands of car models. And so much more. For instance, Hot Wheels and Matchbox cars are on display and in bins. "Customers are welcome to come in and spend a couple of hours looking through them," Theobald said. The majority of the cars are larger diecast modelš in various scales 1/24, 1/8, 1/43, 1/64 and others. Walk in the door turn left, and go all the way to the wall. There, stacked to the ceiling are diecast cars beginning with ‘A’ — Audi, Alfa Romeo and AMC. Come in the door and go all the way to right, and you’re looking floor to ceiling at Zimmers and Willys cars. Higher up around the store are specialty models — famous drag racing cars and NASCAR racers and military vehicles and police cruisers and ambulances. Some of them cost over $150, but most of the cars in the store are from $20 to $60. And they’re beautiful, because the store’s owner is fussy. Very fussy. We should all have garages as neat and orderly and organized as the Auto Antiques store. Pick an interesting car, and Mark Theobald, who owns the store, will take you to models of it. TV and movie cars are also good sellers — he can’t keep models of the A-Team van in stock. . . . .If you re looking for a Maserati or Lamborghini, or MG or Triumph or 240Zmodel.... he has plenty of those. Theobald, 60, got involved with cars when he was 4 years old and managed to drive his dad’s car down the driveway and across the street without hurting anything or anyone. An exemplary musician and bookish historian of coachbuilders and cars, he’s written an encyclopedia about coach builders who made some of the most beautiful cars every produced. He’s been a car wholesaler. He’s worked on cars. He played in the Syracuse University jazz ensemble. And a few years after marrying a psychiatrist, Sarah, whom he met while working at Strong Memorial Hospital, he opened a store in his father-in-law’s barn in Wells, VT.
That store sold only automobile books but had a humming market. Today, in Auto Antiques in Palmyra, he has 5,000 car books; 80 Ferrari books, 70 Mercedes books, 60 Porsche books, 60 Rolls-Royce books, books on Corvettes, Mustangs, Camaros, Mopar, Ford... you name it, he’s got it. In Vermont, Sarah had stopped working, to take care of her mom. After five years, Sarah needed more, and took a job with the state of New York, and the Theobalds moved to Holland Patent, NY, near Utica. The second store, a converted 1875 country store, sold books and cars, with a huge NASCAR collection. Coming back to the area last year (he was raised in Greece), Theobald looked at 10 properties east of Rochester and found Palmyra. The intersecting highways and traffic light were perfect, although he’d like a much bigger store. Auto Antiques sells cars and books, yes. But also magazines — many complete sets from the first edition to the last, like Sports Car Graphic. He’ll sell you two vintage Hot Rod issues for $6. Not too many years ago, they were $20 apiece. He sells automobiliana signs. Oil signs. Gas signs. Car brand signs. Oil filter signs. Some start at $12. He sells the literature you used to find in car dealerships. He has press kits. Advertisements. Brochures. Photographs. DVDs. Posters. Model kits. And everything is neatly arranged and alphabetized. It’s easy to come in for one thing and leave with several. And then there’s Mark, who is conversant with just about anything automotive. Start talking to him for a couple of minutes and asking questions, and pretty soon an hour has flown by. If baseball fans have a hot stove to gather around, gearheads have Auto Antiques. It is a unique place, a rewarding experience. Nestled in the Village area of Holland Patent stands a quaint, two story building for the Adirondack Motorbooks & Collectibles. We had an opportunity to meet with the owner, Mark Theobald, who is an incredibly knowledgeable individual when it comes to all things automobile. Entering the store brings about the feeling of stepping into the pristine wood interior of a magazine quality camp many of us would enjoy spending time in during weekends. The entire location is alphabetized and organized in an almost too good to be true manner. Looking to the far right corner of the front section we see numerous 1/18 scale diecast models near the ceiling and it continues around and behind our heads at the front entrance. With a glance to our left, we see the wrap around and continuance to the back of the store. The floor level shows us rows of documents, classic magazines, article blurbs, and brochures. All in like new quality. I quickly pulled a random magazine from 50+ years ago and it looked like it had never been opened. Something like that is both exciting and heartwarming to see how well kept everything is in the store. Mark certainly takes great pride in finding quality pieces for automobile enthusiasts to come check out in person or decide to take home and add to a personal collection. Continuing on inward through the store brings about factory vehicle literature and enough hard cover books of all shapes and sizes to embarrass any chain bookstore automotive section. The 1/18 scale diecast models are still at ceiling height, but we are now also greeted with Matchbox sized vehicles neatly placed on pegs at eye to floor level. The room furthest away from the front entrance is filled to the brim with additional models all still in their retail boxes, each lovingly placed on the shelf to prevent box damage. At this point in time we had already been at the store for over an hour, only seen 50% of it, and moved about 30 feet from the entrance. Tracing our path back towards the front of the store we can choose yet another path which leads to even more diecast vehicles and Matchbox cars of various, but alphabetized, makes and models. The outside of the store is certainly deceiving in regards to the amount of items able to be stored within. DVDs…and I think I saw some VHS tapes, are also available. This store is just another example of “I can’t believe this place is right here in Central New York”. In addition to being the owner of the Adirondack Motorbooks & Collectibles website, www.motorlibrary.com, Mark is also the curator of www.coachbuilt.com. This website is an incredible resource and glimpses into the world of custom, coach built vehicles from yesteryear. It’s difficult to put into words the amount of work completed here by Mark to compile and post this amount of information. All we have to do as viewers is simply locate and click on any of the 1,200+ represented builders. Please, after reading this article take a little bit of time to check out either of these web pages and complete a browse. There is an absurd amount of information here and will take less time than a Google search on the same subject matter. We here at Apex Automotive Magazine would like to thank Adirondack Motorbooks & Collectibles for taking the time to meet and show us around the store after hours. This article simply cannot fully describe the experience. Be sure to head up and check it all out for yourself. Perhaps indulge in a sweet diecast vehicle purchase to remember the initial visit like I did. We look forward to future visits because the store is in constant flux of what may now be available and what may have been sold since the last visit. However, make sure you set aside a couple of hours to do so because this store is certainly a time vortex. What feels like a half hour visit will suddenly be discovered as three hours passing. Have fun! American Car Culture Lives On In Upstate, N.Y.
HOLLAND PATENT, N.Y. September 17, 2014 – For many curious visitors, Mark Theobald’s hobby shop is the last business they expect to find in this sleepy, Central New York village. Downtown Holland Patent is an equidistant 10 miles north of Utica and east of Rome in the bucolic Mohawk Valley. Theobald’s store is located at 9554 Main Street, two lanes of blacktop dotted with similar mom-n-pop shops after one drives past a gazebo and a small cemetery. Theobald and his “SWAG” reluctantly relocated from their former home in Wells, Vt., in the Green Mountains, after Mark’s wife, Sarah, accepted a psychiatrist’s position with New York State. The Theobalds purchased the former Jweid’s Market – built in 1875 as your basic, full-service country store – nd converted it into a customer-friendly 2,500-square-foot, wood-paneled shop filled with all things automobilia. – 6,500 die-cast replicas ranging in size from Hot Wheels to 1/43, 1/24th and 1/18th-scale NASCAR, NHRA IndyCar, Formula One, Sports Car, Muscle Car, Sprint Car, TV/movie, farm, military, construction vehicles and motorcycle replicas. “Most of what I have other than Hot Wheels is in 1/18th scale…because that’s what sells here,” Theobald said. Indeed, watching the world drive by at 30 MPH from his front window perch has given Theobald plenty of time to contemplate the state of the collectible industry and its customers. “Your typical adult male who used to read magazines and books recreationally – typically they read about cars, hunting and fishing, military history or sports,” Theobald said. “Those guys now sit at home and watch TV. And they’ll go on the computer for maybe half-an-hour a day and think they’ll get all the news and information there is. “My average customer, you would think it would be little kids. Little kids are not interested in cars. Once they hit 5-years-old and get their own iphone and ipad, cars are a done-deal to them, which is sad. And they’re not the first generation who are not into cars. For the most part, their parents are not into cars. People come in here all the time (and remark), ‘Boy, my grandfather would really like this place.’ Or, ‘My father would…’ And these are guys that are 30-35-years-old. Theobald’s NASCAR offerings are highlighted by autographed, limited die-cast editions of Ford stock cars driven by Fred Lorenzen and A.J. Foyt Jr., clearly playing to that mid-60s age bracket. In reality, the fact that the store isn’t all that busy fits neatly into Theobald’s alternative automotive interest. “Having all these books and magazines gives me access to information, which started me writing about coach-building,” Theobald said. “In my spare time, I’m a coach-building historian. I have a website, coachbuilt.com, which I’ve been working on for 15 years. Theobald said he always has been interested in specialty automobiles. “I loved ambulances and hearses when I was a little kid,” Theobald said. “There was an ambulance/hearse dealer probably five miles from the house. So whenever my grandparents took me to go somewhere I made them drive by there. Theobald studied broadcast journalism at Syracuse University for one year before transferring to the State University of New York at Brockport for another year. “I was a musician (jazz guitar) but also was interested in the technical side, the engineering side,” said Theobald, whose two-decade career in the music industry was built around installing sound and lighting systems in large nightclubs. Theobald said the only hobby store he knows of similar to his is located in Burbank, Calif. “They do a drum-up business because people think Jay Leno is going to come there,” Theobald said. “And he does go there occasionally. They have a Cars ‘n Coffee-type crowd; there’s a lot of wealthy car guys in Southern California. “Upstate New York…this is probably one of the worst places you could have a store like this. The local economy is horrible, and it gets worse every year. Unfortunately, the store doesn’t make any money. It’s currently breaking even and that doesn’t count paying me. So it runs at my wife’s leisure, actually. She works and I keep the store and it keeps me busy. Palmyra, N.Y., November 1, 2018 — Award-winning automotive historian and writer Mark Theobald’s lifelong passion for cars has led him to establish Auto Antiques, a source for all things automotive in Palmyra, N.Y.
"Die-cast replicas, signs, sales brochures, books and magazines are almost impossible to find these days," according to Theobald. "I fill the gap that the closure of numerous big-box stores has left in their wake." A decade ago, Wal-Mart, Target and Toys 'R' Us had aisle upon aisle of die-cast cars while Borders and Barnes & Noble featured multiple bookcases full of automotive books and magazines. Today the stores that remain have all but abandoned the auto enthusiast save for a couple racks of picked-over Hot Wheels. Although the big box stores’ automotive inventory vanished, car-lovers didn't. Today's video games are bringing yet another generation to the car hobby and their parents and grandparents continue to remain interested in cars. Both young and old will find what they're looking for at Auto Antiques - and if he doesn't have it - he'll find it for you. Located on NY Route 31, the 2,000-sq.ft store stocks 4,000 new, used and rare books, 50,000 back-date magazines, 200 signs, 10,000 automobile ads and brochures and well over 5,000 die-cast replicas in all scales and price ranges. While the emphasis is on trucks and automobiles, he also carries books and replicas of construction equipment, military vehicles, farm machinery and motorcycles. Included is a spacious coffee bar where people who enjoy and appreciate automobiles can sit and enjoy a complimentary cup of coffee with fellow auto aficionados. First-time visitors will also receive a FREE automotive magazine valued at $3-$6. The shop in Palmyra is not Theobald’s first. Before moving to the Rochester area last fall, he operated a similar operation in Holland Patent, NY - and before it another in Vermont’s Green Mountains. During a career in the wholesale automobile business Theobald developed coachbuilt.com, an on-line encyclopedia detailing the history of America’s automotive body builders, several of which were located in Western, NY. In 2010 at the Antique Automobile Club of America’s Fall Meet in Hershey, Pennsylvania, Theobald’s online encyclopedia was awarded the Society of Automotive Historians’ E.P. Ingersoll Award, which honors the year’s best presentation of automotive history using media other than print. Both the website and his various automotive enterprises have been highlighted within the pages of such leading periodicals as Hemmings Motor News, Old Cars, Vintage Truck, Apex Magazine and many others. "I established the Palmyra shop in order to provide local residents a place where they can inspect prospective purchases in person, unlike my competition who sell and display their merchandise exclusively through the internet. I hope local auto enthusiasts take advantage of the hands-on buying experience that Auto Antiques offers and trust they’ll get the same enjoyment from the automotive hobby as I do," says Theobald. Starting December 1st, 2018, Auto Antiques will be open Friday, Saturday & Sunday between 12:00 noon and 6:00 pm and Monday-Thursday by chance or appointment. The store is located at 610 East Main Street (NY Route 31 at NY Route 21), Palmyra, NY 14522 - directly across the street from Breen's Market and Rite Aid. Palmyra is a historic Erie Canal village located on NY Route 31 between Syracuse and Rochester. The shop is situated 25 miles southeast of downtown Rochester, 8 miles north of NYS Thruway exit #43 and 70 miles west of Syracuse. The store is wheelchair accessible and off-street parking for 20 cars is available directly in front of the building.